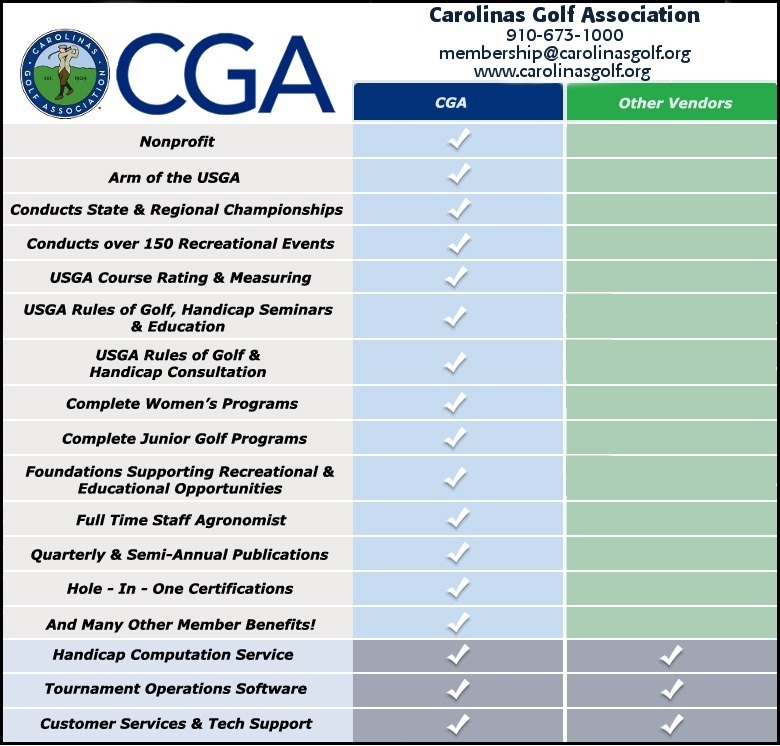 The Carolinas Golf Association serves the needs of member clubs in the Carolinas by providing the following benefits of membership. Dynamic search of name, facility type, city or zip code. Club detail including contact information, website link, and facility type. The CGA is licensed by the USGA to rate golf courses and issue USGA Course and Slope Ratings. This service is offered as a benefit to CGA member clubs. Learn more about the CGA's course measuring and course/slope rating service. If your club needs its tees measured or rated, contact Greg Kelly at /membership-benefits-clubs. The CGA is looking for men and women course raters. Please contact Greg Kelly to learn more. The CGA provides the GHIN handicap service that is the most widely used system in the United States including a tournament management package called TPP (Tournament Pairing Program). Clubs must become licensed in order to utilize the USGA Handicap System and issue a Handicap Index to their members. The CGA conducts handicap seminars to help educate and license its member clubs. CGA member clubs interested in a USGA Handicap System presentation at their club are encouraged to contact the CGA. The CGA offers a dedicated weekend Rules of Golf hotline service to its member clubs professional staffs. CGA Rules of Golf workshops are conducted throughout the Carolinas each spring. Additionally, CGA member club can request a Rules of Golf presentation for their membership. A CGA staff agronomist to assist member clubs. The CGA was the first regional golf association to have a staff agronomist. The Carolinas Golf Foundation to fund scholarships for Carolinas turfgrass management students, turfgrass research to benefit Carolinas courses and junior golf and women's golf initiatives. The CGF has distributed more than $1,300,000 for these and many other worthwhile causes. Special CGA club meetings to deal with golf and club issues unique to Carolinas clubs. A CGA Annual Meeting and Carolinas Golf Night open to CGA club delegates and their individual members. The CGA stays abreast of legislative issues and supports industry initiatives that impact golf in the Carolinas. The CGA provides a variety of digital marketing services at a discounted rate to its member clubs. CGA Member Advantage: promote your club to individual CGA members to boost rounds and increase revenue. Up-to-date CGA website with the latest news, tournament results, handicap score posting, game tracker and handicap verification. Subscription to Carolinas Golf the official quarterly magazine of the CGA, sent to member clubs, free of charge. The CGA conducts 250+ events each year exclusively at member clubs. In 2014, the CGA spent over $900,000 at CGA member clubs on cart fees, merchandise, food and beverage, range balls, etc. CGA Interclub Program open to all CGA member clubs. View all CGA tournament programs available to CGA members. Preferred pricing on event hole-in-one insurance through Hole-In-One U.S.A.
Savings on McCord Golf Services and Safety Videos.